When I put Awakening Foster Kelly down I had no idea what to think. As I read I felt myself writing my review, knowing what I liked and what I didn't. In then it has a twist so colossal in the last 2% of the book that blew me away. I laughed and cried. And I had no idea what to rate it or how to review it. But now that I've stepped away I know that the last 2% will influence the review - but I'm reviewing the whole book, not just the last two percent. So here goes! It was most definitely the characters that kept me glued toAwakening Foster Kelly. They are incredibly well written - so complete and complex I feel as if I know them. The main character is 17 year old Foster Kelly - and the story is told from her perspective. I couldn't help but love her and yearn for that moment where she realized she deserved to be loved. She's a bit different from her peers - very timid, shy, EXTREMELY clumsy (something I totally related to), and self-depreciating. She doesn't even begin to see herself clearly. She's brilliant, a bit of a musical prodigy, and incredibly giving. The highlight of her week? The six hours every Sunday that she spends volunteering at a local home for abandoned kids. She's THAT kind of wonderful person. And yet, somehow, she doesn't believe that she's worthy of love. Yep, she totally broke my heart. And then enters Dominic. He's the boy that SEES her. I have to admit Dominic was a puzzle for me for a good part of the book. I couldn't understand some of his very intense reactions - and I wasn't supposed to. But it really nagged at me - it took way too long for the explanations to come. I felt like I waited and waited and when they did come, it was a bit anti-climatic. I think they would have worked better for me if they hadn't taken quite so long. Anyway - his role is really loving Foster. As he gets to know her and fall in love with her, he helps her fall in love with herself. It's called Awakening Foster Kelly and Dominic is the boy saying "Wake up!" There's also a lot of time spent with Foster's friends - a couple of twins that have very strong personalities and, like Dominic, love Foster, despite her inability to see it. I loved every moment with them. Emily is seriously intense and a bit over the top, and yet I wanted to be her a little bit. And her brother, Jake, was hilarious. He's constantly eating and I couldn't help but see my own teenage boy in him. Foster's parents are incredible too. I loved them and yet I have to say I felt they were way too big a part of Awakening Foster Kelly. Don't get me wrong - I don't think they should have been absentee or ill defined. But we spent so much time with details about them that had no real impact on the story. I have no problem with a book being almost 700 pages. But if I can clearly pick out entire scenes that did nothing for the progression of the book, I have a problem with it being so long. And in this case her parents were one of those problems, as much as I did love them. Gosh, the story of Awakening Foster Kelly is a tough point for me. It took a really long time to get going. At 15% things started to happen and then they quickly detoured and came to a pit stop. Once again at about 34% they picked up again... and detoured again. There's just so much there that didn't do anything for me. We have these really long, extremely detailed dream sequences that I started skimming because they just didn't move the story forward and I really wanted to get to the main plot. The other problem? It felt really familiar until like 50% of the way in... maybe later. It felt a LOT like Twilight, which I MUST point out I actually enjoyed quite a lot. Now let me explain- this is not at all about vampires and not really paranormal at all. There's plenty that's different. And yet it FELT similar. You've got a shy, awkward, clumsy girl who doesn't see herself clearly. She has an initial encounter with a gorgeous guy that goes terribly - he pretty much doesn't speak to her at all, clearly hates her and actually refuses to be her partner in music class. He storms out and disappears for a little over week - having such an intense, inexplicable dislike of her that he has to run away. I swear, I started wondering if I WAS going to find out Dominic was a vampire. And then he comes back and they get thrown together because of a car accident! And he suddenly wants to be her friend and has this big secret... I could go on. The point is, their relationship had so many similarities to Twilight that I was a bit bored with it until it grew a life of it's own and focused less on them and more on the Awakening part of Awakening Foster Kelly. And then there's the great part though - the seeing this girl come to life - that's NOTHING like Twilight. She's not coming to life through romance. She's coming to life through a new ability to see herself clearly, to do things she never dreamed she could do. I loved seeing that. And there's the twist that you so will not see coming! 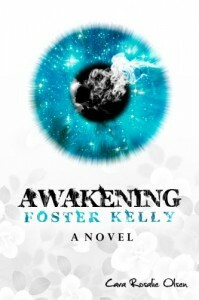 I had such intense emotions at moments in Awakening Foster Kelly mixed in with the the waiting for things to happen. It's definitely got a solid core in there! I wish I could pull out the book buried within Awakening Foster Kelly - which sits at almost 700 pages - and review just that. There's a solid - fairly incredibly book buried in there. But the problem is that it's buried and you have to be willing to dig through to get there.